You can add simple meta tags and descriptions to your site to improve your organic search results when users try to find businesses that match your description. To do this on your site, log in and navigate to a page you would like to enhance. You can do this while a page is being created, or you can edit an existing page. 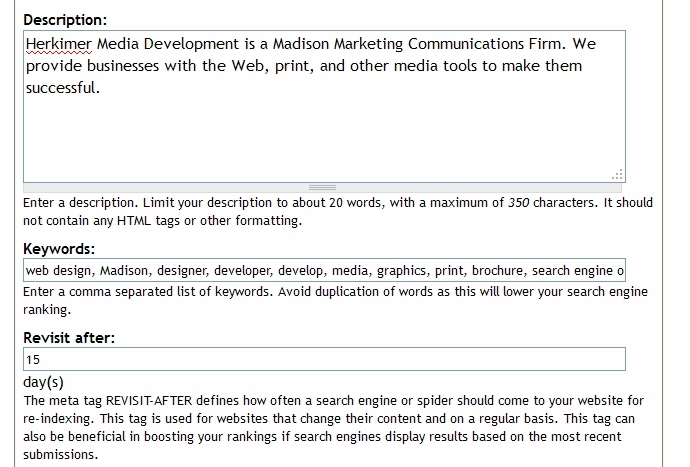 The Meta tags field set appears near the bottom of the page you are editing. (it should appear below the body text, usually 3 items down from the body). Click the Meta tags link to open the meta tag field set. Description: You can enter a description of what your company does here. This is conversational but should include some of your keywords. Keep things short and concise in this field. Keywords: In this field put a list of 10-15 keywords together that you think your clients would search for if they were looking for your business. Separate them by a comma. Do not repeat words, this will be viewed as keyword stuffing and may actually penalize you in the search results. If most of your business comes from local people, it may be a good idea to include location keywords here that identify your city. You can add titles and descriptions to images that you add to the site. This helps with the ADA (American’s with Disabilities Act) compliance for websites by giving a description of the image for anyone who is visually impaired and also helps your search engine results. It is a good idea to include a title and a description of all images you put on your site. The fields for Title and Description appear when you chose an image to load to the site. 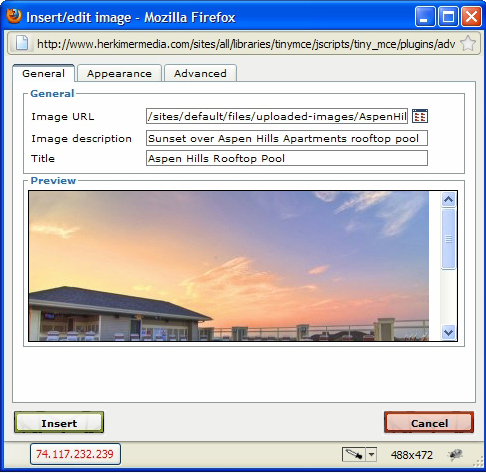 Once you you have selected the image you want to load, but before you click the final insert button, you will be able to edit the fields for title and description. In the title field, you can use keywords and give an appropriate title that applies to what is in the picture. In the description field, try to tell your audience what is in the image. Once the fields are filled out, click insert. For an image that already exists on your site, you can edit the Title and Description field by clicking once on the image to point the focus there, and then clicking on the Insert/edit image button. (This button looks like a tree.) Add your Title and Description and click Update. 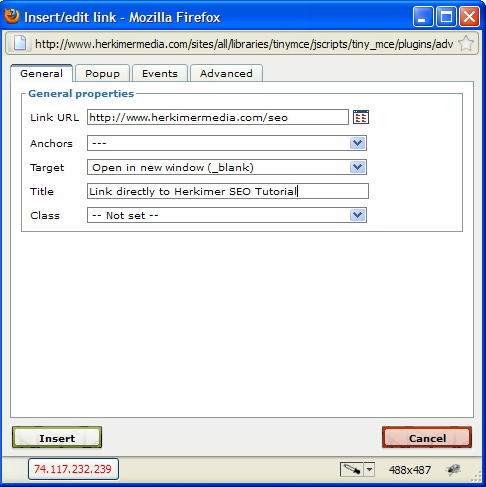 You can add link titles by adding or editing a link and filling in a title for the link. The title should be descriptive of where the link will take you or what it’s intended purpose is. Wanted to let you know how happy we are with the Welch Apts web site!!! It’s been great so far.